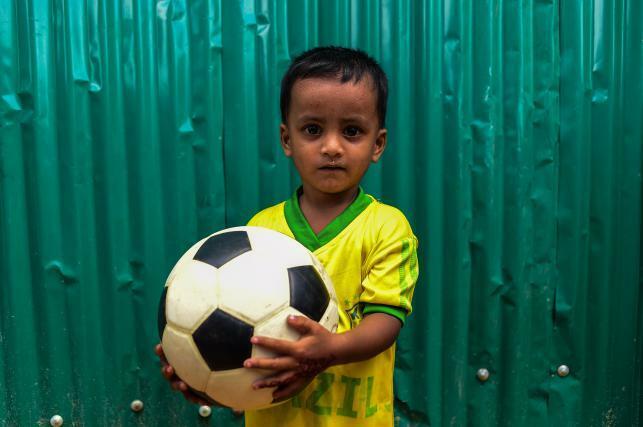 The World Cup may be over but passion for the game burns bright in the world’s largest refugee camp, where Brazil and Argentina flags still flutter alongside the red and green of Bangladesh, which hosts nearly a million Rohingya Muslims forced out of Myanmar. 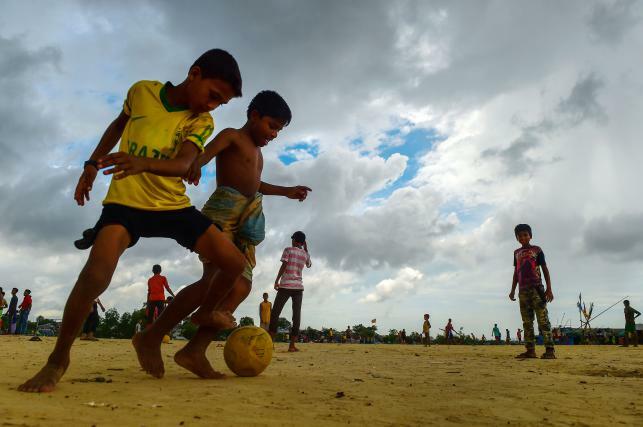 For many young refugees in Bangladesh’s southeast this World Cup was their first, and the excitement of last Sunday’s final shows no sign of abating any time soon. Rohingya boys paraded a miniature replica of the World Cup through the dirt alleyways of the refugee camp, the smallest football fans staring dewy-eyed at the modest golden trophy as if it were the real thing. “My favourite was Argentina. I watched the final. It was between Croatia and France, and France won,” said six-year-old Mohammad Reza, proudly sporting the blue-and-white jersey of firm local favourite Lionel Messi. One of the youngest boys jostling for a glimpse of the miniature cup in its small glass case was five-year-old Nurul Afsar in his Brazil top. “My favourite player is Neymar,” he said shyly, clutching a rubber football. Many fans crowded around one television to watch the final, said 18-year-old Nurul Abser, pointing to a tarpaulin shack just beyond a dirt clearing where football fans had congregated for an afternoon’s play. Dozens of barefoot boys played under threatening monsoon clouds, dodging muddy potholes to shoot at a goal demarcated with twigs. An errant strike sent a ball soaring into the huts surrounding the pitch, as a referee blew his whistle at older players contesting the main match. Apart from the odd Spanish flag or top European club jersey, football loyalties in the remote but overcrowded Kutupalong camp are mainly divided—fiercely—between Brazil and Argentina, mirroring a somewhat peculiar obsession among football fans across Bangladesh. The South American rivalry has been traced back to broadcasts of the 1986 World Cup, when Diego Maradona’s brilliance helped Argentina win the trophy—and legions of fans in Bangladesh, where Brazilian legend Pele was already a household name. Among the many boys of all ages giving their name as Neymar, one stood out: with his hair bleached in the superstar’s signature style, Jahangir Alam bore the closest resemblance to the Brazilian striker, at least in this corner of the camp.